Here's a preliminary snow map. Notice how the snow will last several days, meaning some isolated spots could pick up higher totals. 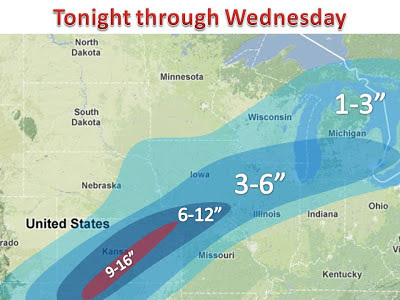 Yet again, Kansas City will get hammered with near a foot of snow, twice in a week. The storm will then sift into northeastern areas, but weaken as it moves. Stay tuned for updates throughout the week.